The following is a 01/21/2013 republished blog post from my farm page. I've added some additional updated comments in italics. At Twin Willows, as at most farms, we tattoo the ears. (Lamanchas have very small ears so you tattoo the tail web in the same way) The herdname designator (ours is TWF) goes in the right ear, and the year letter (preferred letter for 2012 is B, 2013 will be C, etc.) and unique number go in the left ear. Most breeders use birth order to choose the unique number. For example, if the goat you are tattooing was the first kid born in 2012, their unique code would be B1, and if they were the fifth kid born that year, the code would be B5, and so on. This letter/number combination goes in the left ear, and is unique to every goat in your herd. Tattoo pliers are ready with ink. First things first, secure your goat in a stanchion and give him some grain. Procedure: Next, arrange the letters and/or numbers in the pliers, and screw down the set screw. It's also a good idea to set out the numbers and/or letters you will need for the next ear. Once you get the numbers and letters in place CHECK YOUR ORIENTATION ON A PIECE OF PAPER OR CARDBOARD!! This is very important. Even if you KNOW that you put them in right, CHECK ANYWAYS! The worst thing would be learning that you put a number in upside down AFTER you tattoo the ear. 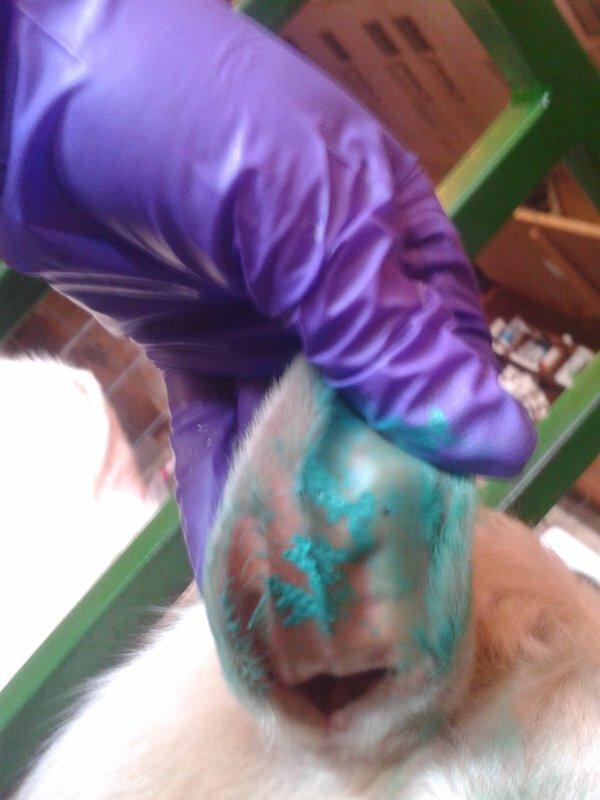 Next, put your gloves on and dispense some of the green ink paste onto your toothbrush. Coat the needles with the ink on the toothbrush. Note: I have found over the years that if you coat the ear with the ink paste after you clean it, and then push the ink through the ear with the pliers, that your letters will last longer. 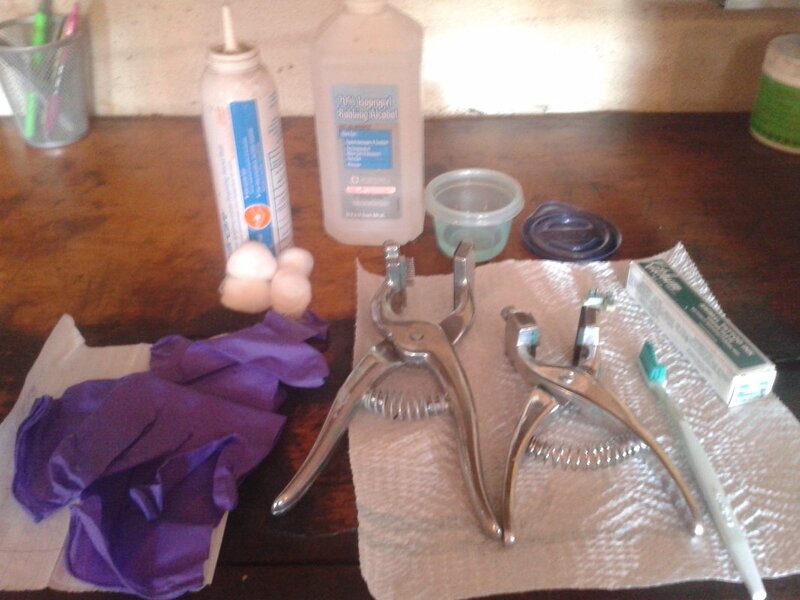 Next, apply a liberal amount of antimicrobial foam to a cotton ball and clean the inside of the goats ears. Use a clean cotton ball for each ear. ​Next, position your pliers to the inside of the right ear to apply the herd designator. Be careful to position the letters/numbers to a smooth part of the ear to attempt staying away from any veins. I'm sorry I do not have a picture of positioning and applying the tattoo, as I did not have enough hands. Here is the result of applying the first tattoo. I got it in there pretty crooked, but hit no veins so it will be just fine. Next, take your toothbrush and scrub the ink into the wounds. Change out your letters/numbers for the next ear (or grab your other set of pliers.) Repeat the same process using the new code for the left ear. Remember, date code and unique number go in the left ear. 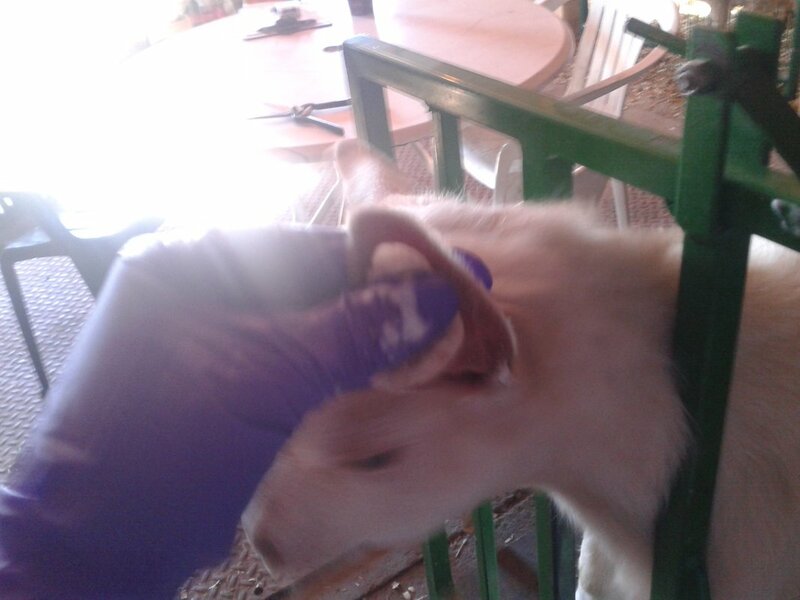 Your goat will probably be more jumpy when you start the next ear, so have someone help hold his head if he is too much to handle by yourself. After both ears are tattooed give him some love, and tell him he was a good boy. I like to let them finish eating so I can watch them for a few minutes to make sure there is no bleeding. When you are finished tattooing, your pliers, letters, toothbrush and everything else that has ink on it (it always gets EVERYWHERE!) can be cleaned up with the rubbing alcohol and paper towels. I like to soak the letters in a small container of rubbing alcohol. I recommend NOT taking your gloves off until you are done cleaning. 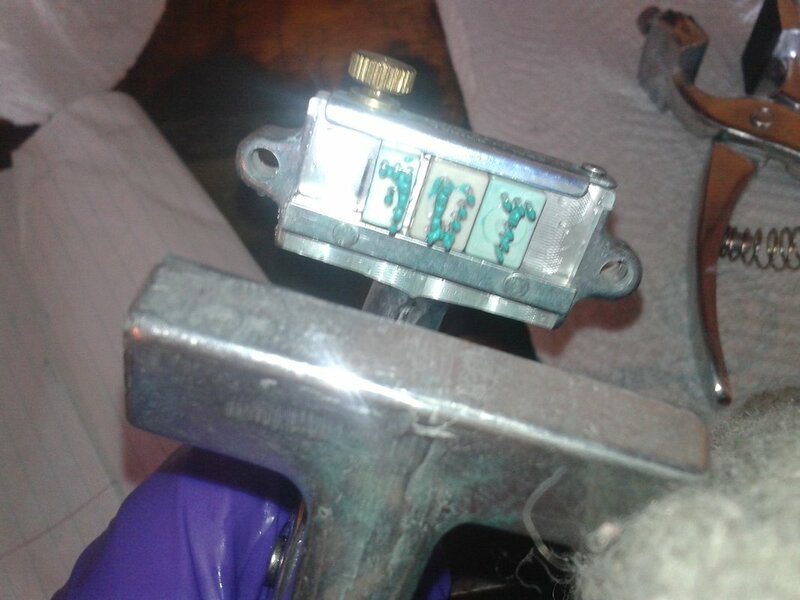 Note: Rubbing alcohol works very well for cleaning ink, but eventually it will rust your letters if they are not dried off properly, so make sure you do. The green ink will wear off in a couple days, after he smears it all over his face and everyone else in the herd! A word of caution: If you do happen to nick a vein when you are tattooing (as I did this morning on Asteroid's brother, Alfalfa) stay calm and don't panic. Apply pressure to the bleed and liberally apply blood stop powder ASAP, and the bleeding will stop. This was the first time I've ever nicked a vein when tattooing. I was prepared, and the blood stop powder was only about 5 feet away. It bled ALOT, but I managed to get it stopped quickly and he is no worse for the wear.